While scale degrees are typically represented in musical analysis or musicology articles with Arabic numerals (e.g., 1, 2, 3..., sometimes with a circumflex above the numeral: , , ...), the triads (three-note chords) that have these degrees as their roots are often identified by Roman numerals (e.g., I, IV, V, which in the key of C major would be the triads C major, F major, G major). In some conventions (as in this and related articles) upper-case Roman numerals indicate major triads (e.g., I, IV, V) while lower-case Roman numerals indicate minor triads (e.g., I for a major chord and i for a minor chord, or using the major key, ii, iii and vi representing typical diatonic minor triads): other writers, (e.g. Schoenberg) use upper case Roman numerals for both major and minor triads. 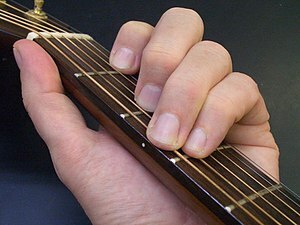 Some writers use upper-case Roman numerals to indicate the chord is diatonic in the major scale, and lower-case Roman numerals to indicate that the chord is diatonic in the minor scale. Diminished triads may be represented by lower-case Roman numerals with a degree symbol (e.g., viio7 indicates a diminished seventh chord built on the seventh scale degree; in the key of C major, this chord would be b diminished seventh, which consists of the notes B, D, F and G♯).